Disney XD has announced the Guardians of the Galaxy animated series will premiere officially on Sept. 26. The premiere will be preceded by a special sneak peek on Sept. 5. 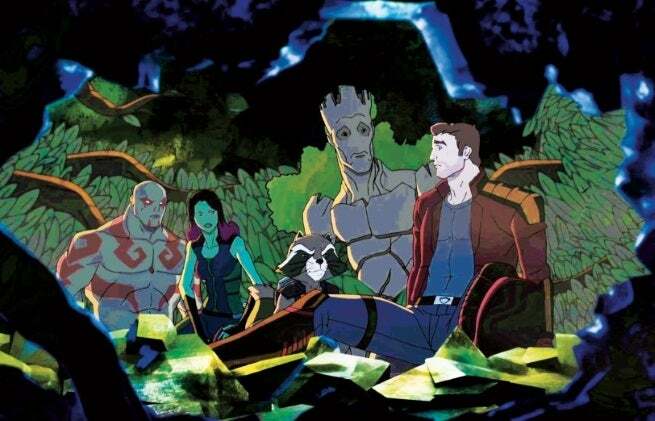 The animated series features the same team of characters as the movie - Star-Lord, Groot, Rocket Raccoon, Drax, and Gamora – and while they won’t be voiced by the movie actors, Marvel Animation has tried to get the voices as close to the big screen as possible. Friedle is the former Boy Meets World co-star whose previous voice work includes playing Terry McGinnis in Batman Beyond. The series narrative will involve a “treasure hunt” related to Star-Lord’s mysterious past. Along the way, the Guardians will have run-ins with Thanos, Loki, Thor, the Grandmaster, and the Inhumans. Wacker also promises a prominent role for Cosmo, the telepathic dog who had a cameo appearance in the Guardians of the Galaxy movie.